Ivan had brain surgery a couple months ago in an attempt to control his seizures. So far, the results don’t look promising. His recovery from surgery has been remarkable. He is gaining his strength and skills back quickly. Unfortunately he is also still having seizures. They haven’t abated and that is bad news. So why don’t I feel it? My friend calls me: Hey! How is Ivan? How are you doing? Me: Well, not great I guess. Ivan’s still having a lot of seizures. Friend: Oh my God! Oh no! Are you just feeling awful? Are you in tears? Are you just a puddle on the floor? I’d be a puddle on the floor! Me: No. I don’t know. I don’t really feel bad. I’m just doing what needs to be done to help Ivan in his recovery. I know this is bad news. I am totally aware that I should be a puddle on the floor. I can see the puddle, but then I just step over it and go make Ivan breakfast or take Ivan to PT or do the other million things I need to do to care for him. It’s like I just don’t have time to feel the pain, so I don’t. And I realize that this isn’t new. I’ve been not feeling for a long time. Is it OK to not feel? I don’t feel sad. Ivan may have significant disabilities, but it’s not something new or terrible. I know how to manage this. We’ve been here a long time. And that means that generally I am able to focus on the good parts about our lives rather than the sad parts. I don’t feel guilty. I’ve made a lot of decisions as Ivan’s mother and some of them have been better than others, but all of them were based on the information given to us at the time and all of them seemed like the best option. The decisions weren’t bad even if sometimes the outcome was. I don’t feel guilty for making any of these decisions. We put a lot of work into researching and talking to doctors and professionals. If I were back in that same place again I’d probably make the same decisions. I don’t feel angry. I’m not upset with any doctors or therapists who have helped us with Ivan’s care along the way. Nobody has purposely given us faulty information or has been negligent in any way. No one is at fault for anything. I don’t have anything to feel angry about. I don’t feel hopeless. I’m not out searching for any “cures” or thinking that things will change dramatically for the better in the future, but that doesn’t mean I’m lost in hopeless despair either. I’m perfectly comfortable with where we are and I am doing my best to prepare for where we are going. That isn’t to say the future doesn’t scare the living crap out of me, but that’s not the same thing as being hopeless. There is one feeling I do feel a lot. I do feel grateful. For all the help and support from my close friends. For family members who stand up for us and help us through tough times. And especially for Ivan’s strength and good nature. How one boy can be so strong and always smiling through so much is beyond me. 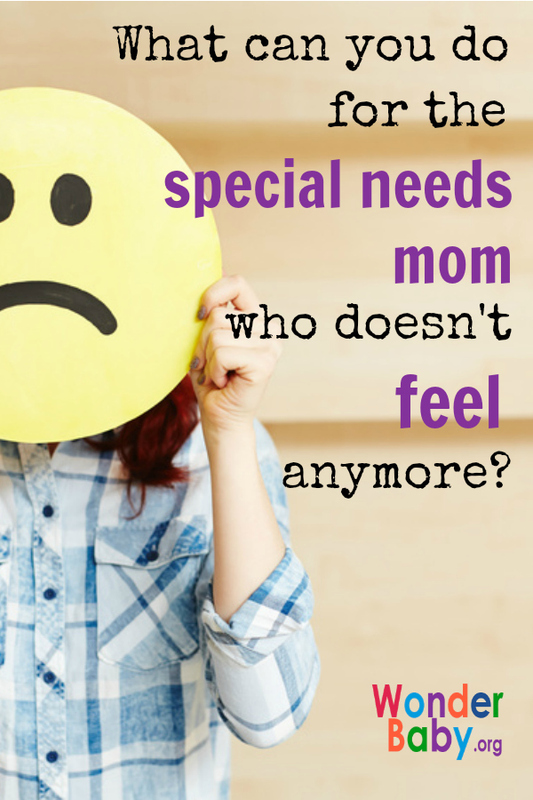 So what can you do for a special needs mom who doesn’t seem to be feeling the bad feelings anymore? Maybe just let her be. Maybe it’s just a coping mechanism, maybe we should all face our fears and feelings with complete honesty and fully experience them. Or maybe life has a way of moving on past the “bad” things and we are able to find a new equilibrium. I wouldn’t say I’m numb or in denial. Maybe what looks like a “bad” life to others just feels like normal life for my family and we’re ok with it. Maybe I’m even happy. The one piece of advice I would give is don’t make your non-feeling friend feel guilty. One of my friends came by after Ivan’s surgery and said, “You look good. Actually you look too good. Why do you look good? You should be falling apart.” What started out as a compliment, turned into a judgement of my demeanor. I don’t need to hear things like that. It does make me feel a bad feeling… annoyed. Tray Haven Keeps Everything On Your Child's TrayWhat does it really take to make a home accessible?